These economy-priced feeders are designed exclusively for the hobbyist. Feed saver lips minimize spillage. 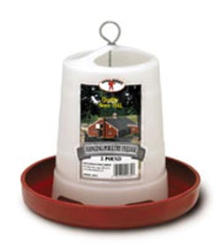 The 3 lb is perfect for chicks and baby quail The 11 lb and 22 lb feeders feature adjustable feed levels. Anti-scratch vanes help prevent crowding and feed waste.